There are a lot of these “foods to avoid” lists floating around the internet I so was inspired to make a list of my own. This includes both synthetic dyes (like FD&C Red No. 40, Tartrazine, or Blue No. 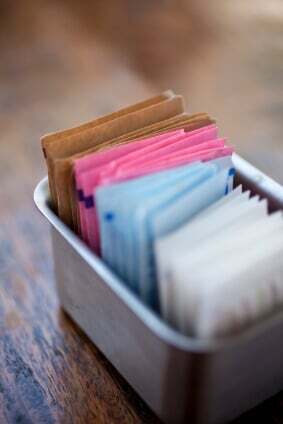 1) and artificial sweeteners (like saccharin, aspartame, or sucralose). When you look at the history of food artificial ingredients haven’t been around all that long, and I don’t know about you, but I am not interested in being the guinea pig here. Plus the fact that artificial dyes require a warning label in many countries outside of the U.S. is enough of a deal breaker for me. Instead: Look for dyes that come from natural sources (like paprika, saffron, or annatto) or forget the coloring all together (it’s only for aesthetics). When it comes to sweeteners pick those that come from natural sources (like honey, maple syrup, and even sugar) over the artificial stuff, but always consume them in moderation (see #2). It’s not that refined sweeteners themselves (like sugar) are the devil, but the quantity in which sweeteners are consumed these days is honestly the scary part. Sugar (or corn syrup or cane juice or brown rice syrup or whatever creative name is on the label) is no longer reserved for truly special occasions anymore, and instead is lurking in yogurts, breads, crackers, flavored oatmeal, beverages, and even innocent-looking salad dressings. Instead: Rely on natural sweeteners like honey and maple syrup since they are mostly “processed” in nature and at least contain some trace nutrients. BUT it’s important to remember that “sugar is sugar” no matter what you choose. So even if you go the more natural route (which is recommended!) that by no means gives you the green light to turn up the bottle. It’s also helpful to buy foods “plain” (like yogurt, oatmeal, etc.) and sparingly sweeten them yourself to make sure things don’t get out of hand. This includes products made from white flour (usually labeled as enriched “wheat” flour), white rice, corn meal, etc. When grains are refined the most nutritional part of the grain (the bran and germ) is removed. This prolongs shelf life among other things, but remember…real food should (and does!) rot so avoid the science experiment and stick to the whole grains provided to us by nature. Instead: Give up the white stuff and rely on nutritious whole-grains like whole-wheat flour, oats, brown rice, quinoa, and others. “Factory farms” raise animals in incredibly crowded and confined quarters so some (literally) never see the light of day. What’s more these animals are oftentimes fed unnatural diets (for instance cows were meant to eat grass, not corn that, by the way, is likely GMO) and given unnecessary synthetic hormones and antibiotics to ensure they produce the most abundant meat products as quickly and efficiently as possible. According to Michael Pollan, “You are what you eat eats, too” so animals raised in such an unhealthy environment in turn produce products that are not as nutritious for you as the local, pastured (or wild caught) alternatives. Not to mention the negative impact these factory farms have on our environment and the inhumane manner in which these animals are being raised. Instead: Shop your local farmers’ market for humanely raised, pastured animal products. If you are concerned about the higher cost, then just eat less meat. It’s that simple. And when selecting seafood always pick the “wild caught” variety so you know they were raised in their natural environment and eating their natural diet. Rather than memorizing a complicated list of chemicals to avoid in packaged foods I am going to make this one really easy for you. Don’t buy anything packaged that’s made with ingredients you wouldn’t cook with at home (which are usually items you can’t even pronounce). Instead: Stick with simple products made from a handful of pure ingredients or make food yourself from scratch. “While olive oil and other pressed oils have been around for millennia,” refined alternatives like shortening, soybean oil, and even canola oil are fairly new on the scene. That’s because they are basically science experiments that were dreamed up in a lab by the food industry. These highly processed vegetable oils are cleaned with chemicals, genetically modified, and sometimes even hydrogenated so as a result we like to avoid them as much as possible. As I touched on above there are a wide range of “flavored” products available these days including everything from beverages to yogurts to oatmeal to cream cheese. Trust me, food factories are going to use a lot more sugar, salt, oil, and unrecognizable ingredients than you would use to flavor these foods at home. This includes anything that’s trying to pretend to be something it’s not. Like margarine (or vegan “butter”), processed cheese products, imitation crab meat, pancake “syrup,” and “lemonade” powder. Believe it or not there used to be a regulation requiring manufacturers to clearly label foods like these as an “imitation.” But of course these products were looked down upon so it’s no surprise that the ever-so-powerful food industry got that regulation thrown out the window. The bottom line is that imitation foods are a highly processed “fake” version of the real thing. Instead: Buy the “real” versions of imitation foods like real butter, real cheese, real crab, or pure maple syrup, and make lemonade with real lemons (not artificial powder!). You are off the hook. “Diet” foods are not only more processed (to get the fat out), but they never tasted that good anyway. As it turns out, according to Michael Pollan, “We’ve gotten fat on low-fat products.” And that’s because when they take the fat out of these foods they no longer taste good so they have to add in a bunch of sugar (see #2 above). Binging on sugar and other refined sweeteners is the real issue here…not eating healthy fats like our ancestors have survived on for centuries. Instead: Switch to full-fat dairy (including milk!) and avoid low-fat packaged foods all together. It’s an amazing feat, but fast food places have somehow managed to screw up the most innocent, wholesome-sounding real food meals like oatmeal, sandwiches, and salads – “Even the salads at McDonald’s are full of high-fructose corn syrup and thickeners made from corn.” So how about we all agree to “vote with our dollars” and avoid fast food joints all together? Instead: Planning ahead is key when it comes to avoiding fast food restaurants while on the go. Before you leave the house each morning be sure to have all your meals mentally planned out in your head so you aren’t caught off-guard empty handed. And always have some wholesome snacks (like dried fruit, nuts, or Lara Bars) on hand just in case you get in a bind! What’s on your personal list of foods and ingredients to avoid? What is your opinion on Stevia and Monk Fruit as sweetening agents? I feel better since I have switched from other artificial sweeteners to these. Hi I have had fibro for 20+ years and suffer every day. I also have T2 diabetes taking injections 2x per day and tablets 3x per day. Just recently my son has asked me to follow the PALEO diet which follows the same rules as above. I have lost 2.5 stones in weight and feel a lot more energetic and better well being in general. Which in turn has reduced my cholesterol(HDL & LDL) & helped my diabetes. I can’t say for certain if it has reduced my pain but it has defiantly helped me to be more mobile therefore cope a lot better about it. I’ve always heard that people who eat junk feel like junk & people with fibromyalgia who eat like junk REALLY feel like junk. Keep up the efforts, it’s worth it to feel better! What are your thoughts on almond flour? Is there a nut free alternative out there to Almond flour that I can use without having to alter the recipe (ie: adding more egg/flax gels when subing coconut flour, etc)? Thanks for the article. Since a close friend of mine was dignosed with colon cancer I have been researching a lot on processed food and I have to tell you your blog seems more authentic than anything I have read up in the web so far. Nice that your site is cleary sponored by Dyson—why should we read anything on this site? Articles are not bad but do not like being led to an ad by the sponsor. Why is Larabar the only bar you mention (and in more than one place)? And with a link even? Larabar is owned by General Mills, one of the biggest of the food giants out there. There are so many good bars out there. It undermines the message a little to see blatant product promotion of an industry behemoth. Hi Shannon. Food politics aside, it is Larabar’s ingredient list that gets the thumbs up. Hi! Do you consider all dairy alternatives to be imitation? We make almost everything from scratch due to food allergies, and earth balance and alternative milks such as soy and coconut are a god-send, and I feel very healthy, if not healthier, than their dairy alternatives. Thanks in advance. Utmost consumer do not realize that “live food” (unprocessed) has significant vitamins and enzymes that are demolished in their processing. The result is the intake of empty calories with additives, many of which have a long “rap sheet” of adverse effects on the body. My question is, if you don’t know much about any of this, is there some very very simple ways to start out with?? I found an answer to my question about whether coconut oil is okay. I have the unrefined on the shelf. Now I nedd to look for recipes. Question about butter. I checked every brand available in my store. They all say “flavoring agent” on ingredients. Why is that okay? Hi Linda. Did you look for an organic butter? I looked at every product available. No organic butter. I can buy organic lettuce sometimesm and recently carrots and celery. In the summer I can buy organic bell peppers and spinach. I can go to the actual organic lettuce and may or may not get lettuce this month. They will have organic eggs and frozen organic pork. That should have read: I can go to an organic farm this time of year. Can you show me any, scientific, peer reviewed proof that organic foods are any more nutritious or safer than conventionally raised foods? I would also like to see any scientific evidence you may have that show GMO’s are less safe to eat than conventionally or organically produced foods. Any reported deaths or direct links to disease from GMO food consumption that can be credibly reported ? The comment that cattle are often fed unnatural diets of corn and should be fed only grass is misleading to your readers since corn IS a grass. As livestock producers, our business lives and dies on how well we treat our livestock. If we cared for our stock the way many portray us, we would have been out of business a very long time ago. Please do yourself and your readers a favor and actually visit a working farm before demonizing a majority of U.S. farmers and ranchers. There is a documentary out called GMO OMG Is This the End of Real food? Kinda gives you more insight on GMOs and farming in the US verses other countries. There is a scientist that does an experiment involving GMOs on rats fed with grain produced by GMO seeds and they grew large tumors. It really is a fascinating documentary. That rat study has been discredited and pulled from the publication, as has every study that has ever been published that puts GMO’s in a bad light. GMO’s are the most tested food in our kitchen, and yet Big Organic continues to demonize it while lining their own pockets. The entire GMO OMG movie has been discredited. I hate to say “google it” because everyone looks at articles and articles aren’t facts. It’s such a shame that the most promising solution to our food waste issue, nutritional deficits, and just plain feeding hungry people is being demonized by an industry (organic/supplement/bloggers) trying to make a buck. I have no issue with people making a living. But do it honestly, with facts, with integrity. The study you reference was first published in the Journal of Food and Chemical Toxicology in Sept of 2012 and was retracted by the publication in November of 2013 for good reason. See attached link for more information and please read the comments and criticism from the scientific community regarding the study you mention in the documentary. GMO OMG is another scare mongering documentary looking for a problem that does not exist. Some common sense regarding GMO’s at the link below. I have an autoimmune disease and was told to stay way from GMO’s and processed foods by my Hepatoligist doctor. And please you don’t have to be rude and tell people to use common sense – in our heads we are just as in your head you are. It all depends on your perspective. So if you want to make your claims at least be nice about it. Thanks for your comments about canola oil. The food editor of Ajc usually says to use canola oil in her weekly recipes. Hi Rachel! Most people can tolerate canola oil, but it is made from rapeseed. One of the largest GMO produced “food” behind corn, wheat, and soy. This is one of the reasons it is so important to read your food labels. I recommend replacing canola oil with 100% extra virgin olive oil (a trusted brad) or unrefined extra virgin coconut oil. My mission is to help people reduce the amount of chemicals they digest everyday by teaching about food and reading food labels. I want people to feel confident that food choices they make in the grocery aisle will enhance their health. Where can I get ghee in Matthews, NC? Hi there. I also live in Matthews and find it at Publix or Fresh Market at Promenade. Whole Foods and Earth Fare are sure bets as well but that is more of a hike. :) Harris Teeter will likely also carry it if you request it. Why do you refer whole milk over skim, soy,or almond milk? The skim milk is highly processed to remove the fat and probably worse things (than the fat) are added to make up for the fat being removed. And here is more info: https://www.100daysofrealfood.com/2012/06/07/milk-101-whole-raw-organic-low-fat-etc/. What do you think of Truvia or Stevia? I use those for sweeteners for my coffee and yogurt. Hi. Truvia is a blend of stevia and a sugar alcohol. You can find stevia drops that a pure stevia. Really love the article and it really covers what i believe too. One query I have is that in the grains section I think you should recommend wholegrain rice as opposed to brown rice as I think brown rice can be aa processed as white. What is a Lara bar, is there a uk equivalent product?. Not sure about UK products but here is Lisa’s homemade version: https://www.100daysofrealfood.com/2012/07/01/recipe-homemade-larabars-4-ways-including-nut-free/. I think some of the Nakd bars are quite similar – made with dates and cashew nuts – some varieties have more added ingredients (including natural flavours) than others. I’m not sure if they’re organic or not. My son is allergic to dairy and we have made daiya products, tofutti, and follow your heart products a staple in not only his diet but all of ours. Are their products a big no-no? Hi. Many of the vegan products do tend to be pretty highly processed. Just look closely at the labels and look for those that have a short ingredient list without additives and artificial ingredients. I find Dr. Praegar’s products to be a good example in that area. Having a plan is definitely key to success. Hi, I am wondering what your take is in instances of food allergies? My son was off the top 8 allergens due to food allergies. We have recently brought in eggs but the others are still out. The vegan spreads are one concession we need to make. But what kinds of foods/meals do you recommend for someone who is off many foods? We do lots of whole meats, fruits and veggies. Just curious because I always see stuff about peanut butter, cheese, milk crackers etc on your lunch boxes and diet. But we can’t do those. Hi there. We have lots of readers and even team members with various food allergies and sensitivities. We encourage everyone to make the adjustments which are necessary to work for your family. I don’t do dairy or gluten and have to work around that. It is all very doable with a bit of trial and error. I absolutely loved the article, as it was extremely enlightening. Thanks ! As a fan of Stouffers and artificial sweeteners – I realized how much “stuff” I must be ingesting. My daughter suggested I sign up for 10 days and see how it might work for me. How do I avoid sweetener as a diabetic type 1-I cannot use syrup, honey ir real sugar as it would put my blood sugar level up too much and I cant drink rea without sweetness of some kind and stevia or truvia have a bitter taste I find canderel to be most tasting of real sugar,although its chemicals it doesn’t move my sugars up! Holly, I am in the same predicament.. Type I diabetes here. My mother who is also Type 1 is also having the same trouble. We both brew kombucha but she is finding that even when she lets it go really tart, it will run her sugar up. Even drinking just small amounts. Have you guys looked into Stevia? Stevia’s taste overwhelms everything even in the smallest amount of has an aftertaste worse than aspartame. I had to quit sugar and assumed Stevia would help but ut forced me to learn to live without sweetner. I’ve adjusted. You don’t need to worry about it. No study has ever been done showing that artificial sweeteners cause health issues (at least none that have not had to be retracted later). Use them in moderation. Don’t sweat it. I thought the same of Stevie at first. But like anything, you will adjust. I don’t notice the aftertaste at all anymore. But, conversely, if you’re going to acquire a new taste, why NOT just go sweetener free! Hmm, I may take my own advice and try it for a couple weeks! Lovely dish..its really easy making one..loved it!